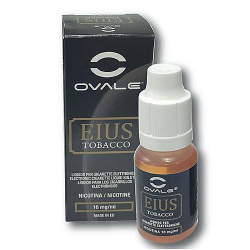 A signature blend by OVALE, EIUS Tobacco is made specially for ex-smokers just making the transition from smoking to vaping. That said, many experienced vapers have switched to EIUS Tobacco as their preferred tobacco blend because it feels just like smoking a real cigarette. Chemically designed as a perfect replica of cigarette smoke, EIUS helps make the switch from smoking to vaping as easy as possible. This allows the new vaper to adjust better psychologically and not miss smoking so much. Considering many beginner vapers go back to smoking because they can't find an e-liquid that feels like real smoke, EIUS Tobacco is a truly revolutionary e-liquid. The vapor from EIUS Tobacco can be termed as a mild-to-medium average of many different types of tobaccos that range from Oriental to North American cultivars. Each tobacco has a specific ratio that results in vapor that is neither too dry or moist. EIUS Tobacco is a very thick and smoky vape loaded with juicy tobacco flavors, it delivers an earthy vapor with a slightly woody aftertaste that lingers for just a moment to let you enjoy your vape to the maximum. Speaking of enjoyable, enter the throat hit: The throat kick is mild but absolutely fantastic at lower output and nicotine levels, it feels like a soothing massage. When you turn up your battery, the throat hit becomes quite strong and can be adjusted by vaping higher or lower nicotine versions - there is a sweet spot for everyone. As good as EIUS is on the inhale, the exhale also deserves mention: Both the mouth and nose exhale are simply phenomenal, and that is no small feat. The vapor comes out with an unbelievably sophisticated feeling to complete the inhale/exhale cycle. 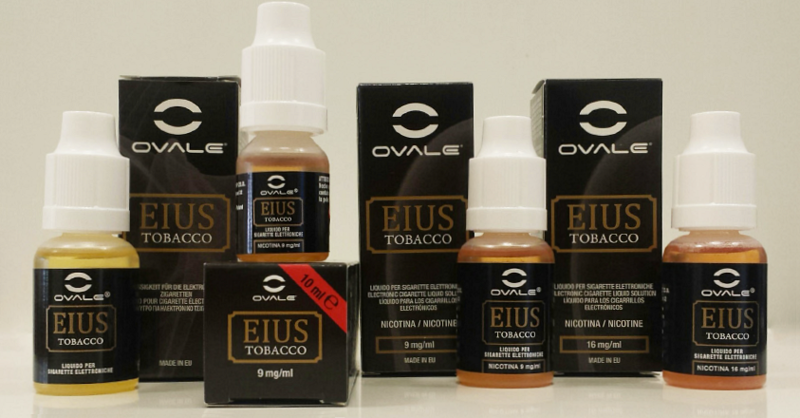 As with all OVALE liquids, EIUS Tobacco also has a proprietary PG/VG ratio and vapes incredibly well regardless of output, resistance and nicotine levels. It's balanced so good, you get massive clouds of pure white vapor every time you draw on your ecigarette. Flavor transmission is also top notch - there is absolutely no loss in flavor as the e-liquid is atomized into vapor. Everything said, EIUS Tobacco vapes like a dream - you won't be able to tell if you're vaping or smoking, it's that good. Manufactured by Life Italia Prodotti S.r.l - a licensed pharmaceutical company registered with the Italian Ministry of Health.